I wrote an article recently on How to Broadcast to Facebook Live from your Computer using the free software OBS Studio. This free software works really well, runs on Macs, PCs and under Linux and you can stream to your Facebook page, profile and groups. However, there is another tool on the market that is highly recommended, and that is Wirecast from Telestream. There's no question, this is the professional live streamer's tool, and the price reflects this with a starting price of $695. I'll be giving a full comparison of OBS Studio and Wirecast soon, but for now I wanted to walk you through how to broadcast from your computer to Facebook Live using Wirecast. Many marketers are choosing Wirecast as their main tool including Mari Smith, Guy Kawasaki, Joel Comm, Jeff Sieh and Mike Stelzner. Going Live from your Computer? Facebook Live launched last year with a feature to stream live video from your phone. It started rolling out to verified users first, and then to iOS users and Android users have begun to receive access to Facebook Live on their profiles recently. It's also possible to go live to groups and pages from your smartphone. But, Mark Zuckerberg has his sights on something much bigger. At the recent F8 Facebook developers conference, Mark Zuckerberg displayed drones, 360 cameras, studio set ups and more - all of which integrate with Facebook Live. Combine that with Facebook acquiring virtual reality headset company Oculus VR and the future of Facebook Live is very exciting! You can now broadcast live from your computer, using multiple cameras, webcams, share your screen, apps and even your smartphone to all your friends, group members and business page fans. You can do this for free using OBS Studio (see my guide here) or using the professional software Wirecast here. Wirecast is paid tool (starting from $495) however they do have a free trial. I highly recommend trying both Wirecast and OBS Studio to see which one is going to best for you. Like, OBS Studio, Wirecast supports multiple displays at the same time (including picture-in-picture) and you can easily set up keyboard shortcuts with slick scene transitions. In fact, Wirecast has more varied scene transitions than OBS. Like OBS Studio, Wirecast supports Facebook Live out of the box. Wirecast in some ways is a little easier to set up than OBS Studio, as you can just click a button to connect to Facebook as opposed to fiddling with stream keys. Until recently, Wirecast did not allow you to broadcast live video to your Facebook groups. In a recent update, however, Wirecast allow you to broadcast live video to your Facebook groups as well as your pages and profile. However, I've kept the alternative way of broadcasting to Facebook Live using the RTMP protocol because it does allow a bit more flexibility. If that means nothing you don't worry, just choose the easy option! There is a "go live" feature in the publishing tools section of our Facebook pages, but you don't need to use this with Wirecast. You can connect your Facebook account with Wirecast directly. If you are going live to your Facebook profile, you can also select privacy settings to share publicly, with only your friends or just with yourself. Click Refresh, then click OK. There is a different way to stream to Facebook Live from Wirecast. In this you can create the post on Facebook directly and mention other profiles and pages. This uses a similar method that I outlined in my previous article on How to stream from your computer to Facebook Live. We're going to connect with Facebook using the Facebook Live Video API. In Wirecast, we'll choose the RTMP protocol and you'll need a "streaming url" and "streaming key". That’s fine for developers, but it's not easy for the rest of us. Where do you get the streaming url and key? I’ve made it easier for you all by creating a button that connects to Facebook Live using the official Live Video API. All you need to do is click the button at the top of this article. Click on the "Broadcast on Facebook Live" button above (at the top of this article). A pop-up window should appear. If it does not, you'll need to check your pop-up settings in your browser to allow pop-ups. You can't go live yet, since you'll need to enter the stream url and key into Wirecast and start your stream so that Facebook can receive it. Now we need to give Wirecast the correct settings so that it can connect with Facebook. Enter in your Facebook username and password into the pop up window, then click OK.
Once you've set up your webcam or screen sharing you are ready to go live! It's now time to go live. Click Output, then "Start/Stop Broadcasting" then click your Facebook Live stream that you created earlier. If you want to stop your broadcast, simply click Output, then "Start/Stop Broadcasting" then click your Facebook Live stream. Click Output, then "Start/Stop Broadcasting" then click your RTMP Server Stream that you created earlier. Now, return to the Facebook Live pop up that was launched from the "go live" button above. Enter your update text and the video title and optionally some video tags. When you want to stop your broadcast, simply click Output, then "Start/Stop Broadcasting" then click your RTMP Live stream. Uff , some days its ok , but many times is imposible the conection!!! I am about to get my hands on Wirecast for the first time. Hoping to learn it faster. Thanks, Robin. Great stuff! And make sure you get the 30% discount they’re running right now! Hy Lymm, you’ll need to give me much more information for me to help you. How i can upload the video after done streaming ? Ian, We just started using Wirecast to take our Sunday Services live on Facebook. We are a non-profit and set up with Facebook Payments, so we really want to add the Donate button on the Live feed, but can’t figure out how to do this from inside Wirecast. If you have any suggestions, we would be grateful. Ian, thank you so much for taking the time to reply. You can totally add a Donate button into your live video from inside Facebook (https://www.facebook.com/help/377796675887629), but you have to do it before you go live, which is where the conundrum comes in. We go live in Wirecast, so we can’t add the button before going live. I was hoping you might now if Wirecast has that functionality. I wrote their tech support but never heard back. I’m not familiar with the Facebook messenger bot, but I’m going to totally explore that. Thank you!!!! Hi Tammy, ah, that’s great – thanks for that. From looking through the documentation, it looks like this is only available from mobile – Android or iOS. And that means you have to broadcast from mobile too. So no Wirecast or any other software. It’s a bit difficult for me to test on my page because I’m not based in the US and have a valid page (a charity) to test. I’ll check with the Wirecast team, but if you can’t edit the video from desktop to add the call to action, I don’t think this will be possible. Sorry! Is there a way to produce multiple streams to engage an audience through facebook live? Think of a panel discussion where multiple experts speak on one topic and push out the stream through facebook live. Possible? Hi David, I may not be understanding you correctly, so please do give me more details so I can help. But, you can technically stream multiple streams to Facebook – to the same page or different pages at the same time. You’d need multiple computers streaming separately to get the best results. Wirecast Pro also has the ability to stream different audio tracks at the same time, but that’s more for streaming different language tracks at the same time. www. facebook .com is currently unable to handle this request. Hi Dinorah, As I have mentioned to others, could you check again? I tried this a couple of hours ago and it worked fine for me. It could have been a temporary glitch? It certainly affected a few people yesterday. Great article! I have been using your “Broadcast on Facebook Live” for a few months now and it has worked perfectly with Facebook however, for the last few weeks, whenever I click “Go Live” the window just disappears. When I go to end the broadcast I can’t click to post it. Any ideas?? What’s else works with Wirecast in terms of cameras. Can you use my android and it will still be good quality? Sorry I missed your comment, Mark. You can use Android and iPhone cameras. The quality probably won’t be as good as decent webcams, but it might be worth trying. I’ve tried both the Wirecast Facebook Live setting and the RTMP setting. The Facebook live setting is easier, but if the connection is interrupted it needs to start a whole new post/video. Whereas with the RTMP setting you can reconnect to the existing post. Seems like a flaw, should people stick with RTMP? Are there any advantages besides convenience for using the FB setting? Hello, You can also connect the audio mixer output to your main camera input. Use an XLR input. That’s how videographers record more than a couple of audio sources. (You could even use a wireless transmitter hooked up to your camera) The source from the main camera is set as your Wirecast audio source when switching. Any switching from camera to camera will only output the main camera audio. Don’t use a separate audio input to your computer as it only adds potential issues to your set-up. Ian, thank you for your help to the live streaming community. I am wondering if there’s any way to control PTZ cameras from either OBS or Wirecast? Thanks, Lee. Interesting question. The most important consideration is, can you display the image of the camera on your computer, either as a device or in a window. If you can capture the video from your camera using a capture card, for example, an HDMI capture card like this – https://www.amazon.com/Blackmagic-Design-UltraStudio-Mini-Recorder/dp/B009D91314/ that will work- you’d just chose the capture card device as the device in OBS or Wirecast. Or if your camera allows you to display the video in an app window, you’d choose a display capture. Hope that makes sense. Thank you Ian. I appreciate your reply! I can’t get anything to show up in my “live source” audio window! Any tips? I’m unable to capture any audio! Hi Jim, apologies, your post ended up in my moderation queue due to the link. It depends on how you’ve set things up. What audio are you trying to capture? Make sure you check the box “capture system audio” if you are wanting to capture the sound from your desktop. Hi, Revian. Unfortunately, this can happen. Something is blocking your connection. Can you check your upload speed? It should be at least 5Mbps UPLOAD speed, but ideally a lot higher than that. I’ve also sometimes found that Facebook just blocks the connection and I’ve had to wait. Or, I have used a different connection or a VPN service like Private Internet Access. I wish I could be more helpful, but hopefully that does help! I am getting the same “Cannot connect to RTMP/FLASH server at the given IP address. Verify the server is reachable at the given address. [-4018]” error on Mac OS X, but when I go to my windows machine, on the same network, to the same facebook account, it works. How can I debug the OS X issue since this is just affecting a single machine? I have also tried with and without VPN, and multiple locations on VPN too. Something else is causing this issue on Mac. Hi Mike, That is very frustrating. I’ve had similar issues very occasionally. I could never get to the bottom of it. It sometimes worked on my PC and not my Mac and then the other way round. The same when comparing OBS Studio and Wirecast and with a VPN and not. At the end of the day I have a feeling that the issue is with certain FB servers. Some of them allow connection without any issues, and some servers are being picky. I’d try again and see if it works. Have you tried contacting Wirecast support? Hello. I want to broadcast online on YouTube + Facebook. He writes error: “Facebook restricts simultaneous streams to other online services”. How to fix the error? Yes, Facebook’s terms only allow apps that use their API to broadcast to only Facebook. If you want to broadcast to Facebook as well as YouTube, you’ll need to choose RTMP and use the button at the top of this article. Super tutorial! I would like to be able to stream from desktop to my FB group. I see now that wire cast does this directly which sounds great! Although I’m still hoping to do this less expensively. I am fooling around with OBS. It possible to stream to a group with OBS? I’m only seeing the FB Page/Key option, but I’m brand new to it. Wow! great article! thanks for sharing this. Thanks, Abegail! Glad you found it useful! What a great article, I had no idea that wirecast had upgraded to being able to broadcast to FB Live. Question: Do you know if wirecast will work with DSLR Canon t5i? Seem to be pretty difficult to make it work with DSLRs, but you mentioned above that it works. Yes. You will need a capture card like Game Capture HD60 | elgato.com. It is what I use and is perfect! It has! And the latest version of Wirecast – 7.3, even gives displays the number of shares, comments and reactions to your live video. Really cool! I click on the button BROADCAST to FB live. Then the Popup comes up. After I click NEXT, no more Popup comes? This probably means you are officially logged in to your Facebook account. If in Wirecast it shows your Facebook user name, you can now enter a title, description and choose where to stream (profile, pages, groups, etc.) then can start to create your live event! While I am streaming, how can I get an idea of how many users are looking at my stream and how can I interact with them if the only thing I have open is wirecast? At the moment you should pull up the Facebook stream on your phone or in a web browser. Then you can keep an eye on comments and live viewers. There is no view counter in Wirecast. It’s a common question – for both OBS Studio and Wirecast users. A good way is to use your smartphone or tablet while you are live. You could even attach this to your microphone stand. Or, put this on a separate monitor and check it there. UPDATE: There is now! In Wirecast 7.3 you can now see how many viewers, comments and likes your live stream on Facebook has! If you still want to read the comments you will still need to open a browser or another device, but the new tally counter is a great way to keep track of how much engagement your stream is getting. Thanks, Andrew. Great to see how quickly you are adding more features and integrating with the Facebook Live API! Thanks for replying, Andrew. I’ve not had a chance to reply to these comments until now. I agree, it does sound like a bandwidth problem. Am I right in saying you can reduce the quality for Facebook Live in Wirecast if you select RTMP? I wonder if that is an issue for the bandwidth impaired? I’d just like to say thank you so very much for building this and allowing anyone to use it. I have started doing a lot of Facebook live streaming to chat with friends all over the world and it can be so cumbersome using my iPhone or iPad. Being able to do this right from my desktop makes life a breeze. Hi! What is the optimal output settings for facebook live in terms of bitrate, framerate etc.? And the encoding options? Guess i’m a little confused! If you set it up using RTMP, you can tweak the settings that the default FB ones (that start at 2mbit) don’t allow you to. I have seriously downscaled mine via RTMP because I only have a 1mbit upload here in Cape Town, RSA. Tonight I tested it, and it worked very well. For a normal web broadcast, this is a godsend, because 2mbit on a 1mbit upload is only feasible with no moving image. That’s a great tip. Could you share a little more about the settings you used? That would be really helpful for others here. What was the quality like in the end? I wonder if it would be possible to tweak the settings for the Facebook Live (as opposed to selecting RTMP). Hi! thanks for this info!!! Now a situation arises me is that when I give to get the key transmission on facebook, let me in standby mode, there is a solution for that? thanks again bro! Hi, Jonathan. Sorry, I don’t quite understand. What happens when you add the stream key from Facebook? If you give me a bit more information I’ll be happy to help! Hi Ian I’m a dj and got wirecast to go live on fb were ever I would dj but they are not letting me and they blocked me from going live for having music !! That’s not my own is there something I can do ? Oh no, sorry to hear that. The problem is Facebook takes copyright very seriously. Unless you own the copyright or own a licence and can prove it, Facebook can take down the video or ban you from using Facebook Live. I’ve heard from a few people who have been banned for up to 3 months. You could try and appeal or show them you have a licence or own the copyright. I have been trying to do this in Wirecast but it doesn’t populate in Facebook when you hit preview, it says offline however shows it streaming in Wirecast. Hi James, do you get any error messages? Could you try the alternative method (RTMP) I listed in this article and see if you get the same issue. If you have a full version of Wirecast perhaps try their support. If you get anywhere with this let me know. A few people have experienced similar issues with OBS Studio and while I suspect it’s to do with their router or ISP blocking the connection, we couldn’t get a definitive answer. Hi Ian: How do you set up wirecast to record for later playback on Facebook? Hi Al. So, do you want to record your video, and then stream that video to Facebook Live using Wirecast? If so, you just need to add the video as a media file in a scene and then stream that Facebook Live. I’m not sure if you were asking this, but you can also save your live streams to your desktop in Wirecast. Yes Ian, I didn’t explain it right, but YES that’s what I want to accomplish. I was thinking (incorrectly) that I would somehow record the video in wirecast. But if I understand you correctly, I need to record using “let’s say” QuickTime and add it in wirecast as a media file then stream to FB when I’m ready to go live? Yes, that is one way of doing it. You could also do a live segment at the start, then transition into your recorded video – played as a media file. Lots of options! Hi Trig, yes there were issues a few days ago. This issue didn’t affect Wirecast users using the normal method, however, Facebook was having issues with their Live API from Saturday onwards. Thankfully they fixed after I submitted a bug report. Let me know if it is working for you now. How do I stream a live sports stream on my smart tv or laptop to facebook live using my iphone 6? Hi Shah, you want to use your iPhone’s camera to stream to Facebook Live from your laptop? If so, you’ll need to use an app like Reflector to get your iPhone’s screen on your desktop and then capture that as a scene in Wirecast and stream that to Facebook Live. Using OBS I can not make it work. it worked yesterday and today is telling me that an error occurred. Any suggestions? Hi Hector. This issue didn’t affect Wirecast users using the normal method, however, Facebook was having issues with their Live API from Saturday onwards. Thankfully they fixed after I submitted a bug report. Let me know if it is working for you now. Hi Ian, how can i use my iphone 5 to steam live on Facebook through Wirecast? Can i test this with the free trial version? I just need to live stream a few minutes of a friend gathering on my Facebook page, with my iphone. Thanks for helping out! Hi there! Do you mean you want to screencast your iPhone’s screen to your computer and stream that to Facebook Live? If so, I recommend an app called Reflector 2. Once you download that you can connect your phone to your computer and the capture the app in Wirecast and stream it to Facebook Live. Hi and thanks a lot for your article. Unfortunately the button above doesn’t work at all. It seems like there is no reaction. The trouble shooting guide didn’t helped either. Can you give a quick advice what i could do to make it work? I also tried chrome, firefox and IE… thanks a lot! Hi Stefan, There was a temporary bug that found its way on to this page today. Sorry about that. I’ve fixed it and it should work. Could you try and let me know? No problem at all. Glad I could fix it so quickly! Hi, do you know why the windows closes when I try to stream live from some pages? And this pages don’t apear on my the Wirecast list of my pages? I have tried a live broadcast from wirecast to my group – which worked just fine. However, none of the live videos I have done could be seen when viewers watch from Safari. Is this a known issue to wirecast, or perhaps Facebook live? Hi Stephanie. That is really strange! I’ve never come across that before. It shouldn’t make a difference whether you use Wirecast, OBS Studio or your phone to stream to Facebook Live. Have you experienced this with any other Facebook Live videos, or is it just the ones you are producing? Hi I have managed to set everything up to do a live video from my facebook page however when i go live it just shows the webcast grey preview page and doesnt broadcast me anything can you help? Is it full HD or 720? Can I use smartphone as my camera? Is it possible to use 2 smart phone as my cameras? For the time being I would use 720p because that’s the max resolution Facebook Live accepts. Hopefully they’ll do full 1080p full HD soon. Great article. Quick question – what do you think is the best way to interact with your audience/monitor questions if you’re using wirecast? Hi! Is there a way for me to stream wirecast on a facebook live in one state and have a 2 person shot with 2 different people living in 2 different places? So I’d basically be the control board and my clients would be the ones live on camera. Thanks. how about if i would like to post live stream to my Facebook fan page through wirecast, is that possible? Yes you can. That is what this article is all about. You can stream to your Facebook profile, page or group using Wirecast. Hope this article helps. Hi Ian, thank you for you great insight to this it makes Facebook live so simple, I have one question I have a Cerevo switcher how can I use that with Facebook live switching? Hi Gary, sorry for the delay, I’ve been on vacation. In all honesty I don’t know as I am not familiar with the Cerevo switcher. Can you provide more information about what it is and how it connects to your computer? Thanks! Hi Ian, I want to start a Live Web TV which will also available on Smartphones through Apps and integrated with social media (like Live on Facebook etc.) I need your expertise on complete setup in affordable cost. I think Wirecast solutions with which you are much familiar will be economical as well as effective. Anyways you are expert of this line and will like your consultancy in this project. Can you tell me how can i stop the facebook brodcast after it finishes? It’s just a case of stopping the stream. Just click “Start/Stop Broadcasting” in “Output” in the top menu in Wirecast and it will end the broadcast. Hi Rick. Unfortunately you can’t pause the stream. 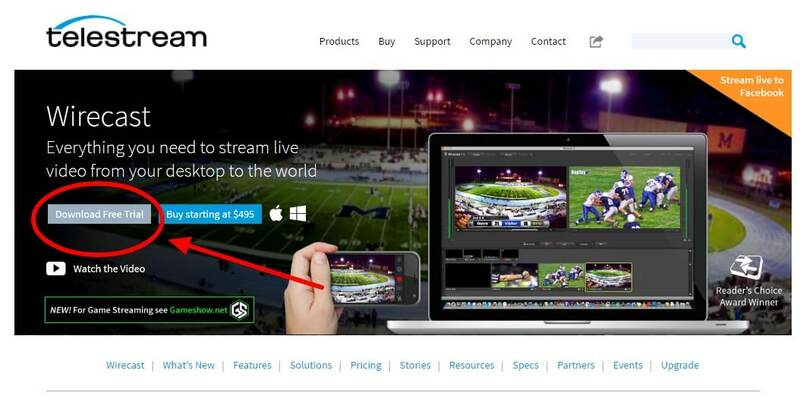 When Facebook receives the stream from Wirecast – that’s it – you are live! When it stops receiving the stream, your live broadcast is ended. Hopefully Facebook will add more features in the future.